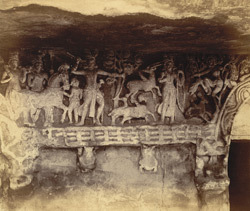 Photograph of the carved frieze in the upper verandah of the Rani Gumpha, Udayagiri in Orissa, taken by William Henry Cornish in c.1892, Archaeological Survey of India Collections. The Jain caves in the twin hills of Khandgiri, or Khandagiri, and Udayagiri, were excavated in the 1st century B.C under the Chedi dynasty. The Rani Gumpha or the Queen's Cave is the largest of the series of caves. It has a double storey, with a spacious courtyard. Both storeys have a freize of relief carvings extending the length of the wall over the doorways. The frieze on the upper storey is better preserved due to the verandah that protects it from the elements. The scene in this view is a hunting scene with a horse and four attendants on the left and a prince with bow and arrow.